“WOLFEBORO — A fatal crash on Route 28, just south of the Ossipee/Wolfeboro town line on Wednesday, May 2, sent shock waves through the Wolfeboro community and beyond. As first reported by the Wolfeboro Police Department, the accident involved a red Mack dump truck, which went into a "non-controllable hard-right turn, later crashing into a large pine tree." 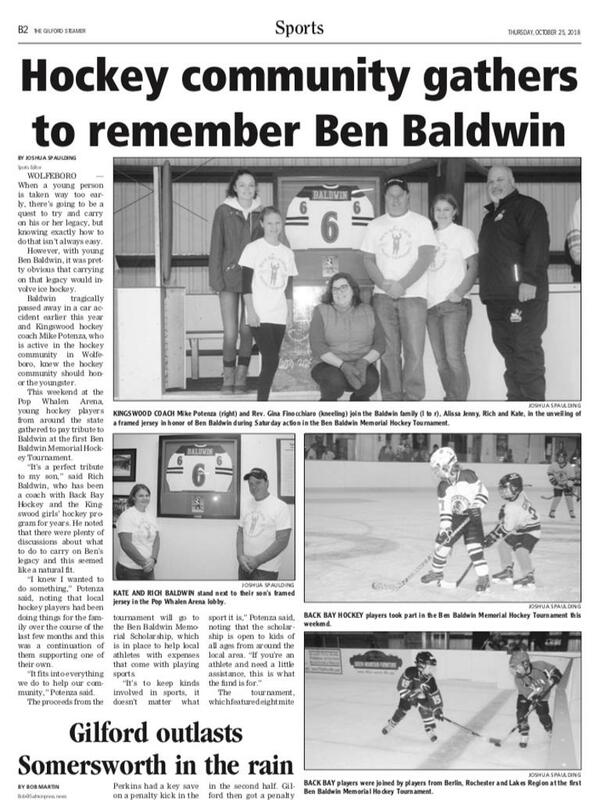 In Ben Baldwin’s name, Kingswood HS Head Coach and NE wolves U18 Coach Mike Potenza organized a fundraising youth Hockey tournament at Pop Whalen rink for this past weekend. To date the fundraiser has generated over 15k in funds for a charity that will Benefit youth athletics and provide opportunities for youth to participate in sports. Youth Hockey teams for all over NH participated including Lakes Region Lakers and Berlin.